After three days of high Pyrenean high-jinks for the GC and breakaway bandits, today should see the action swing back towards the sprinters and green jersey contenders. 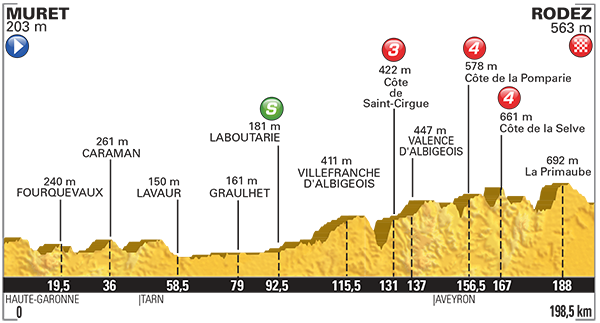 The 198.5km route is certainly flatter but still too jagged for the pure sprinters, I suspect.The intermediate sprint comes just before the halfway point and marks the transition to a final 100km back-loaded with climbs of varying toughness. La Primaube summits at 10km from the finish line and will no doubt be ridden at pace. After that there’s a downhill and a tricky run in through Rodez to negotiate before a ferocious final 600m at nearly 10%. It’s a one hard to call: it could be a day for the breakaway, but I think the puncheurs and sprinters will want their shot at glory, Watch out for Peter Sagan, it should be a finish to suit him – he has to get one at some point!